The seven floors of John Lewis’s recently refurbished flagship Oxford Street store were bustling with Christmas shoppers yesterday. Cashmere for ladies and even babies was proving popular, as were Ted Baker slippers, the bestselling item in the revamped menswear department. The busiest part of the store was audio and television, where iPods and flat-screen televisions were flying off the shelves; upside-down Christmas trees were also proving a hit. Business is booming at the John Lewis Partnership, which comprises 26 department stores and the 187-strong Waitrose supermarket chain. Its management team are confident it will be a good Christmas. Yet in the run-up to this vital trading period, almost every other retailer has been painting a gloomy picture of the high street, as the credit crunch, interest-rate rises and higher bills take their toll on consumer spending. Sports Direct, H Samuel’s owner, Signet, and Moss Bros are among those who have recently issued profits warnings. The British Retail Consortium has also warned that last week’s cut in interest rates is not enough to stimulate spending. Despite the current climate, John Lewis has just reported its biggest week on record at its department stores, with £96m ringing through the tills in the seven days to 8 December. Sales were 5.2 per cent higher than a year ago and nearly 12 per cent up on the previous week. Waitrose is the only major chain not losing market share to Tesco, according to its chief executive, Sir Terry Leahy. What is the secret of the 143-year-old company’s success? He added that the company has also resisted “the temptation to grow too quickly”. “They have not followed a huge roll-out plan and have instead concentrated very much on the service end,” he said. Its strong brand identity is one reason John Lewis has rarely felt the need to advertise on television. This year marked a break with tradition: the company tripled its advertisement investment to £6.2m and launched its second-ever festive television advert. Yet it is deliberately understated, showing a group of people carefully arranging store products in such a way that their shadow casts the outline of the person for whom the gifts are intended. Its aim is to be “stylish, intriguing and intelligent”, which it would say reflects its customer base. Rather than functioning as a public company, John Lewis is owned by its 68,000 staff, who all have a stake in the business. This means it can plan for long-term investment while not having to bow to pressure from shareholders. It also means there are high staff retention rates at the partnership: 80 per cent of staff have more than one year’s service. Nat Wakely, the director of selling operations at John Lewis, says that at the Reading store alone 88 members of staff have service of more than 25 years. “If there is anything anyone needs to know, you just ask them,” he says. And importantly for motivation, the partners share in the firm’s success through an annual bonus as a percentage of salary. Unlike other department stores, John Lewis leads with homeware rather than fashion, and a slowing housing market has worked in its favour, as people have decided to splash out on upgrading their interiors rather than move home. Yet undoubtedly one of the main drivers in the company’s recent success has been its website, which relaunched in August, offering a far wider range of fashion and home technology products. Last week was the biggest on record for the website, with sales up a massive 40 per cent on a year ago. Nick Bubb, an analyst at Pali International, said: “This is the way that customers want to shop with multi-channel retailing. As it is a trusted brand, people are happy shopping with them online.” He added that this was “a huge advantage for them, particularly compared with companies with less successful websites”. The website often takes more cash than the Oxford Street store. Mr Bubb said another major factor in the brand’s success was its “incredible pricing power, summed up with the phrase ‘Never knowingly undersold'”. “BHS and Debenhams are always having 10 per cent and 20 per cent sales it is not surprising customers do no trust them,” he adds. Though the company has grown steadily over the years, its heartland has been the South and central England, where 18 of its stores are located. But there are eight stores in the North of England and Scotland and more to come. In the past six years, the group has opened just two stores, at Trafford Park and most recently in Cambridge, in October this year. But it is ramping up its growth plans and confirmed in November that it plans to open a further 25 stores in the next decade, doubling its store base. It is understood to be mulling Dublin for its first site overseas. The group will also experiment with format. The £64m refurbishment of the Oxford Street store included the first food hall in the chain, with Mark Price, Waitrose’s managing director, put in charge of supplier sourcing and buying for the floor. Waitrose insists that it is 15 per cent cheaper than M&S and only 2 per cent more than Sainsbury’s. Its customers, which are a healthy, eco-friendly bunch, are loyal and prepared to pay more for its unusual products: free- range Hampshire pork cushion with apple-and-cider stuffing was one of the delicacies on the fresh-meat counter yesterday. Despite having just 4 per cent of market share, Waitrose takes 18 per cent of all organic trade and sells 10 per cent of all fish in the country. The next mixed-format John Lewis store has been confirmed for Cardiff and more are expected to follow suit. 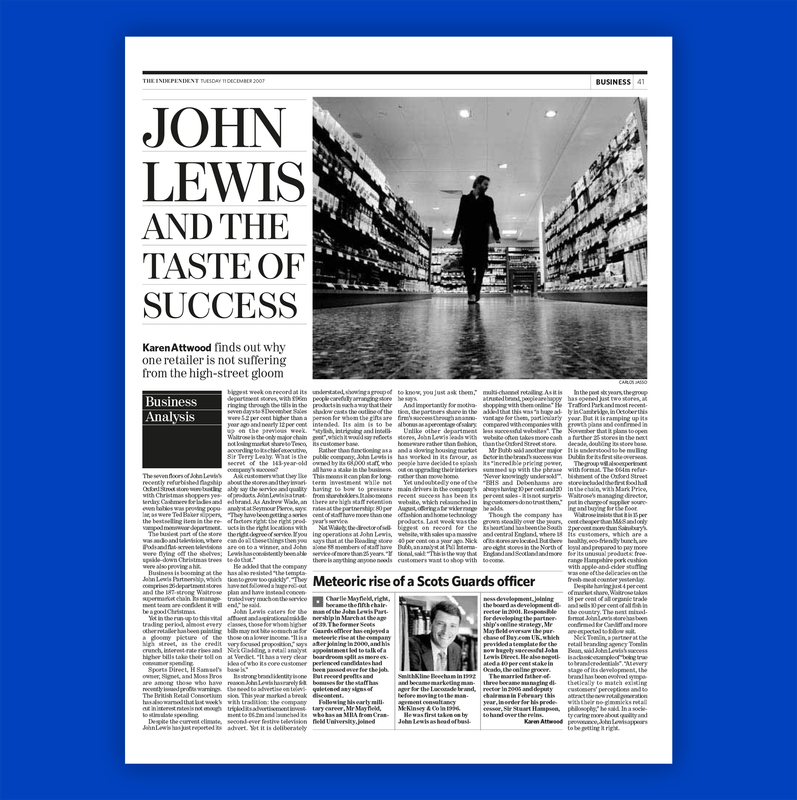 Nick Tomlin, a partner at the retail branding agency Tomlin Bean, said John Lewis’s success is a classic example of “being true to brand credentials”. “At every stage of its development, the brand has been evolved sympathetically to match existing customers’ perceptions and to attract the new retail generation with their no-gimmicks retail philosophy,” he said. In a society caring more about quality and provenance, John Lewis appears to be getting it right. Charlie Mayfield, right, became the fifth chairman of the John Lewis Partnership in March at the age of 39. The former Scots Guards officer has enjoyed a meteoric rise at the company after joining in 2000, and his appointment led to talk of a boardroom split as more experienced candidates had been passed over for the job. But record profits and bonuses for the staff has quietened any signs of discontent. Following his early military career, Mr Mayfield, who has an MBA from Cranfield University, joined SmithKline Beecham in 1992 and became marketing manager for the Lucozade brand, before moving to the management consultancy McKinsey & Co in 1996.